As a form of therapeutic angiogenesis, we sought to investigate the safety and efficacy of a sustained-release system of basic fibroblast growth factor (bFGF) using biodegradable gelatin hydrogel in patients with critical limb ischemia (CLI). We conducted a phase I–IIa study that analyzed 10 CLI patients following a 200-μg intramuscular injection of bFGF-incorporated gelatin hydrogel microspheres into the ischemic limb. Primary endpoints were safety and transcutaneous oxygen pressure (TcO2) at 4 and 24 weeks after treatment. During the follow-up, there was no death or serious procedure-related adverse event. After 24 weeks, TcO2 (28.4 ± 8.4 vs. 46.2 ± 13.0 mmHg for pretreatment vs after 24 weeks, p < 0.01) showed significant improvement. Regarding secondary endpoints, the distance walked in 6 min (255 ± 105 vs. 318 ± 127 m, p = 0.02), the Rutherford classification (4.4 ± 0.5 vs. 3.1 ± 1.4, p = 0.02), the rest pain scale (1.7 ± 1.0 vs. 1.2 ± 1.3, p = 0.03), and the cyanotic scale (2.0 ± 1.1 vs. 0.9 ± 0.9, p < 0.01) also showed improvement. The blood levels of bFGF were within the normal range in all patients. A subanalysis of patients with arteriosclerosis obliterans (n = 7) or thromboangiitis obliterans (Buerger’s disease) (n = 3) revealed that TcO2 had significantly improved in both subgroups. TcO2 did not differ between patients with or without chronic kidney disease. The sustained release of bFGF from biodegradable gelatin hydrogel may offer a safe and effective form of angiogenesis for patients with CLI. M. Kumagai and A. Marui have equally contributed to the study. This work was supported by Health Labour Sciences Research Grant (No. 851110600024). There are no relationships with industry. 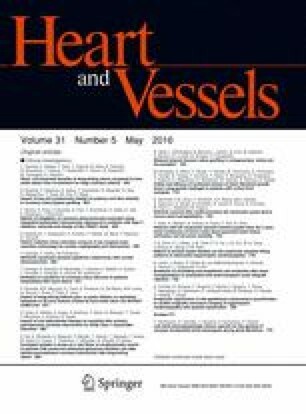 The authors thank Kazuhiro Yamazaki, Kenji Minakata, Hiroshi Tsuneyoshi (Department of Cardiovascular Surgery, Kyoto University Graduate School of Medicine, Kyoto University Hospital); Machiko Oka, Hideaki Toyokuni (Department of Clinical Pharmacology and Therapeutics, Kyoto University Hospital); Tatsuya Itoh (Department of Experimental Therapeutics, Institute for Advancement of Clinical and Translational Science, Kyoto University Hospital); Harue Tada (Department of Data Science Institute for Advancement of Clinical and Translational Science, Kyoto University Hospital); Kumi Mukai (Department of Clinical Innovative Medicine Institute for Advancement of Clinical and Translational Science, Kyoto University Hospital); Makoto Matsui (Department of Biomaterials, Department of Biomaterials, Institute for Frontier Medical Sciences, Kyoto University); Takuro Yuge (Kaken Pharmaceutical Co., Ltd.); Senri Miwa (Department of Cardiovascular Surgery, Okamura Memorial Hospital).